Following an excursion into the world of cabaret at Düsseldorf’s Kom(m)ödchen cabaret stage, she went on to play the role that made a lasting change in her life in 1983: She took the part of “Grizabella” in the German premiere of the international musical success “Cats” in Vienna. “Memories” became her theme song and made Angelika Milster the number one musical star in the German-speaking world. She was given her first own television show (“Mein Musicalhaus” in 1985) and was honoured with the Goldene Europa and a Gold Record. Her acclaim also spread abroad. She was selected by Andrew Lloyd Webber for the role of Emma for the European tour of his song cycle “Song & Dance” in 1988 and she appeared with the “Kurt-Weill-Revue” from the Theater des Westens in Berlin in Paris and Washington in 1991. She also remained loyal to the Theater des Westens during subsequent years, where she played leading roles, among others, in “UFA-Revue” (1992), “Blue Jeans” (1994), “Hello Dolly” (1995) and “Gypsy” (1996). Angelika Milster became a popular television actress in series such as “Der Landarzt” (ZDF), “Salto Kommunale” (ZDF), “Mama ist unmöglich” (MDR) and “Körner & Köter” (SAT1) as well as in films such as “Der König von Dulsberg” (1994, starring Götz George), “Club Las Piranjas” (1995, starring Hape Kerkeling) and “Alles wegen Robert de Niro” (1996, starring Götz Alsmann). From 1994 onwards, Angelika Milster recorded some CDs with pop hits. For the very first album “Ich liebe Dich”, she was awarded the ECHO German record industry prize. This was followed by a further ECHO nomination in 2000. She returned to the theatre stage one year later and appeared in the German premiere production of the musical “Mozart!” in Hamburg. She completely changed her musical orientation early in 2002. Angelika Milster developed an entirely new repertoire of classical and sacred songs for a series of church concerts. The reaction of the audience and the press was equally enthusiastic, which is why this program has since become an integral part of her annual concert performances. In the same year, she demonstrated a hitherto unknown musical versatility on the Crossover CD “Milster”: She interpreted songs from films and musicals, as well as singing pop and hits, but also paid honour to Elvis Presley, Queen and ABBA, continued to surprise her listeners with her interpretations of classics such as “Granada” and “Torna a Surriento”. Her artistic diversity was demonstrated again and again during subsequent years when she adopted the role of the good fairy in the German dubbed version of the Hollywood film “Shrek 2”, took over the title role in “Lysistrata” during the Antikenfestspiele summer theatre and opera festival in Trier and highlighted the ills of contemporary society in the “Ansichtssache” program alongside the actor Max Krückl at the Theater der Wühlmäuse in Berlin. Following a Christmas CD (“Von ganzem Herzen”) and a further crossover album (“Mit den Augen der Liebe”), she appeared in more than 50 towns and cities during the tour “Das Überraschungsfest der Volksmusik” and was once again able to excel with the comic side of her theatrical talent in the RTL comedy series “Angie“. At the request of many fans, she released a new CD with hit-oriented titles (“Ich sage ja”). As a live artist, Angelika Milster remains one of Germany’s most sought-after performers. Ranging from the 2006 and 2008 new year concerts (accompanied by the WDR Radio Orchestra and the SWR Big Band respectively), to the “Swinging Christmas” and grand scale gala event “Diva Maxima”, performing with Montserrat Caballe, Milva and accompanied by the Babelsberg Film Orchestra. She returned to the musical in May 2009 with the solo program “Ich bin wie ich bin”, which celebrated its highly acclaimed premiere in the Grillo-Theater in Essen and still in the same year, she appeared in the song drama “Ewig jung” on the stage of the Berliner Renaissance-Theater. The production was awarded the Publikumspreis des Berliner Theaterclubs in 2010. Alongside her theatre performances, Angelika Milster expanded her church concert tours over subsequent years. Her programs “Begegnungen” and “Von ganzem Herzen” were attended by enthusiastic audiences at well over 500 concerts all over Germany. 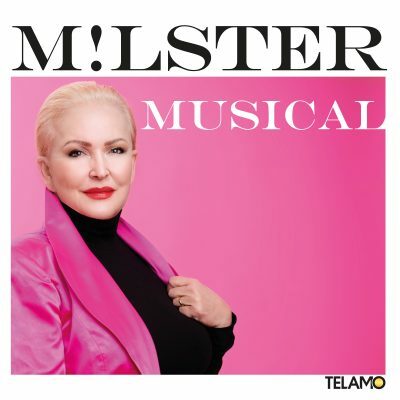 A further CD entitled ”Du hast mir Glück gebracht” was released in 2013 with which Angelika was among other aspects a guest on “Willkommen bei Carmen Nebel” and the ZDF-Fernsehgarten. From autumn 2016 onwards, Angelika Milster appeared in the title role of the musical premiere “Doris Day – Day by Day“ at the Schlossparktheater in Berlin. More than thirty performances were given before a full house. The premiere of “Wunschkinder” followedat the Renaissance Theater Berlin, where she likewise appeared with the piece “Ewig jung”. In summer 2017, Angelika Milster began her new solo concert program “Milster singt Musical” with four successful preview concerts in Austria. Further individual concerts in this program were held in 2017/18 followed in autumn 2018 by a major 14-date tour of Germany. In the meantime, “Doris Day – Day by Day” went on tour throughout Germany and from 24th September onwards, Angelika Milster took up another great challenge that became a further highlight for the singer and actress: The part of “Norma Desmond” in Sir Andrew Lloyd Webber’s “Sunset Boulevard” at the Philharmonie Thüringen in Altenburg and Gera: The summer of 2018 revolved around “Im weißen Rössl” – Angelika Milster excelled much to the delight of her audience at the Renaissance-Theater Berlin. From September 2018 onwards, she represented “Tangolita” at the Theater Lübeck in Paul Abraham’s operetta “Ball im Savoy”. Then, at the end of the year, the theatre production “Im Wechselspiel der Liebe” after a novel by Rosamunde Pilcher (book and lyrics by Claus Beling and music by Richard Blackford) celebrated its premiere in Austria and Germany. All dates can be found on the TOUR DATES page. André Bauer studied piano and clarinet in Zurich and Paris. His received his first engagement at the Zürcher Opernhaus in 1968. Alongside his activity as a conductor, he worked as a composer and arranger. On his appointment as musical director at the Schauspielhäusern in Zürich and Basel, he established his penchant for soundtrack and incidental music. His career has always been associated with the most prestigious names in the world of music, working with directors such as Hans Hollmann, Hans Neuenfels, Arie Zinger, Prof. Sellner, Leopold Lindberg and many more. He has produced, composed and conducted for BMG Ariola, Polydor, Universal, EMI, CBS and Sony Music, looks back over 80 productions at the Schauspielhaus Zürich, Schauspielhaus Düsseldorf, Schillertheater Berlin, Staatstheater Bonn and the Basler Theater and has written the music for two Israeli ballet productions. In 1980, André Bauer produced the music for “Die letzten Tage der Menschheit” for the Vienna Festival / ORF (direction: Hans Hollmann). First encounter with Peter Weck. Peter Weck was appointed artistic director of the Theater an der Wien in 1982 and André Bauer became the theatre’s musical director and principal conductor. Here, he directed the highly acclaimed German premiere of Andrew Lloyd Webber’s musical “Cats” and produced the recording for the on-stage success, which received both gold and platinum awards. On the occasion of his first tour of Japan in 1985, André Bauer brought international pop and jazz musicians together with members of the Tokyo Symphony Orchestra. The album “Midnight Cruise”, produced by André Bauer represented an inspiring amalgamation of the elements of jazz and classical music, a musical style that has had the successful musician in its grip ever since: Crossover. André Bauer left the Theater an der Wien in 1987 to work freelance as a composer, conductor and producer. Angelika Milster and André Bauer have been engaged in creative collaboration since 1983 for more than 90 films and TV series, including “Tatort” (ARD), “Ein Fall für Zwei” (ZDF), “Ein Bayer auf Rügen” (33 series, SAT1), “Der Besuch der alten Dame” (international production with Maria Schell) and many more. He has produced and musically directed the singer’s major successes such as for example the albums “Meisterstücke”, “MILSTER.”, “Ich sage ja”, “Mit den Augen der Liebe” and “Du hast mir Glück gebracht” as well as countless concert programs. The private relationship between Milster and Bauer is also a lasting one: they have been married since 1987.